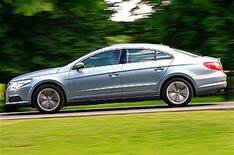 First drive: VW Passat CC | What Car? Its been a good day at the office. The business lunch went well and your clients liked the elegance of your new Passat CC. Its classy but not showy; professional and restrained. It says all the right things about you. You could have gone for the standard Passat, but its just a little bit dull. With its swoopy roof and frameless windows, the CC is a lot sexier than that. Your 2.0-litre diesel was a much more sensible option. The engine is punchy and hushed, unless you work it hard, and it wont cost you or your company too much to run. The ride is comfortable (opting for GT spec brought the adjustable suspension) and, some wind noise apart, its a refined place to sit. Youre comfortable in other ways. The driving position is spot-on, the cabin is classy (if a little too similar to the standard Passats) and the boot is huge. You dont want for space up front, either, although rear-seat passengers may find their heads brushing the rooflining. True, the CC is a four-seater where the Passat will take five, and its around 2000 more expensive, but the Passat isnt as well kitted and wont impress clients as much. Youve done well.